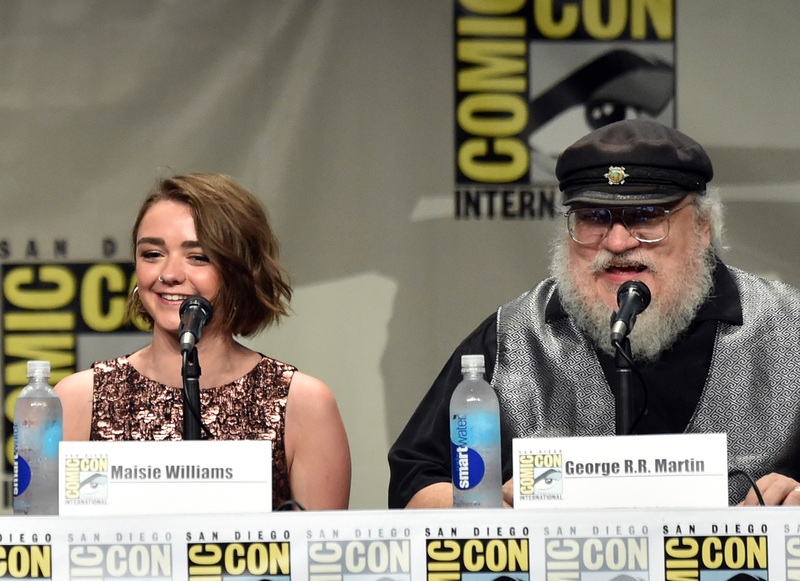 A Song of Ice and Fire author George R. R. Martin is in a bit of a pickle: There's pressure on him from just about everyone in the entire world to churn out his next book, The Winds of Winter, so fans can continue to speculate and theorize about what's to come on season six of the HBO show based on the series, Game of Thrones . Yes, he's supposedly in a writing frenzy, and has canceled tour dates and convention appearances to free up his schedule to type like the winds (of winter). But that still hasn't quelled fans' thirst for new material. In fact, it's gotten so overwhelming that he recently came right out and asked fans to stop asking him questions about season six! However, just because we can't pester Martin about this anymore doesn't mean that he hasn't dropped a few hints here and there about what's to come in Westeros. Lady Stoneheart does have a role in the books. Whether it’s sufficient or interesting enough… I think it is, or I wouldn’t have put her in. One of the things I wanted to show with her is that the death she suffered changes you. Could this be a hint? It would definitely satisfy fans who were heartbroken when showrunner Alex Graves denied that Catelyn would be rising from the dead. And, of course, Martin has been pestered with the question about Jon Snow's fate. The biggest question that lingers after the season five finale: Is Jon Snow really, most sincerely dead? There are countless theories about what's to become of the Lord Commander of the Night Watch, and Martin is being incredibly vague about the fate of our favorite sad boy in Westeros. Jon Snow was also stabbed repeatedly and left for dead in the final chapter of A Dance with Dragons. According to Entertainment Weekly, when asked about Jon's death in 2011, Martin replied coyly: "Oh, you think he's dead, do you?" When he was questioned again after the on-screen stabbing, Martin said just as vaguely: "If there’s one thing we know in A Song of Ice and Fire is that death is not necessarily permanent." Well, what's that supposed to mean?! As far as death goes, though, George R.R. Martin has confirmed that one very important character will die soon. According to Winter Is Coming, Martin recently visited Hamburg, Germany, and said in a Q&A that he was struck with inspiration while on the trip and knew suddenly that one very important character's death was imminent. In a case of meaning getting lost in translation, Winter Is Coming originally reported that the character would be female, but a later correction says that Martin, speaking in German, used a gender-neutral pronoun, so the character could be anyone in the seven kingdoms. That's about all that's come from the author's mouth, though it's been confirmed by season six director Jack Bender that the show communicates very, very closely with Martin, and that eventually the books and the HBO series will arrive at the same destination. Even though the author's pretty tight-lipped about the TV series, sometimes he just can't stop himself from dropping hints, so I'll keep you updated whenever he lets another detail slip.